It's Monday, and Michael's first day of work in Shanghai. Though it's just a very short day, as he's only in to sign paperwork and get a tour of his office and computer. This afternoon we'll begin the process of looking in earnest for long term housing and waiting anxiously for our dog, Lucy, to arrive on a flight from Shenzhen, just across the border from Hong Kong. I have lots of thoughts swirling in my brain and I know I better get them down now because in about a week all the things that are strange will start to seem normal. So here's a peek inside my head. It's word-heavy and picture-light. Sorry. Shanghai is so green. On our honeymoon, Michael and I drove from Orlando, Florida to New Orleans, Louisiana. The highways were wide, with large center dividers filled with grass, reeds, plants, streams, and/or bushes. Shanghai looks identical. It's only the occasional road sign in Chinese or the sound of the wicked-fast Maglev train flying by that clues you in on our actual location. Macau was also very green, but considering it is one of the most densely populated places on earth, filled with high rise buildings, and a very, very small place, the green spaces were very confined. Here the roads are wide and lined with trees. And there is grass everywhere! I am racking my brain, but I don't remember seeing grass in Macau much at all. Even the parks are cement, with perhaps a little grass as accent. There were some big houses behind our high rise building, and in the back yards they had flagstone pavers. It could just be the fact that we are currently staying in "Green City" but even beyond this neighborhood I see trees all over. Shanghai is so big and spread out. Macau is approximately 18 square miles. You could quite feasibly walk from one end of the SAR to the other and back again in a single day. 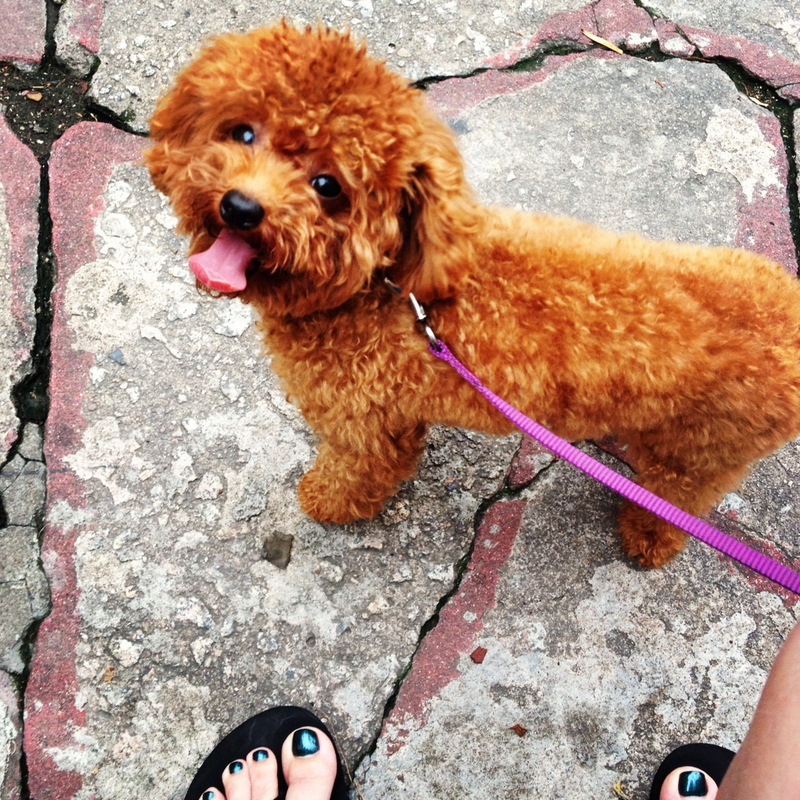 We are accustomed to walking everywhere. Our first evening in Shanghai, we asked the front desk how to get to the Carrefour (the vastly enormous Costco-sized grocery market that I remember from our time in Japan), and we were told we had to take a taxi because it was too far. We took the taxi, thinking they were right based on how long the drive from airport to home was. Of course, Carrefour was only 1.2 km away, and totally walkable in our opinion (we've done it twice since our first night). But that's the exception. We tried to go to another store which the front desk told us was "close" and the taxi ride took nearly 20 minutes in fairly light traffic. We come from Los Angeles, where everything is an hour away, so you'd think we'd be more used to the vastness of Shanghai. But a year in tiny Macau has skewed our sense of distance. We've been told to avoid the bus system due to huge crowds and the lack of English signs (sounds like a challenge to this girl). Due to Michael's position, we are not allowed to drive a car (too dangerous, a risk the company doesn't wish him to take). So we're stuck with taxis. They are fairly inexpensive, but the drivers do not speak English and we don't even know where to ask them to take us. Yet. 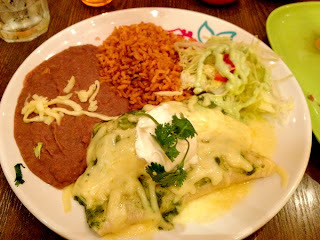 Cantina Agave Chicken Verde Enchiladas... muy delicioso! The food here is so good. In Macau we didn't eat out very often. There were a few places we went to, but there was almost nowhere that we'd actually crave, as most places had bland, plain choices. It was more of a convenience. And while I don't love to cook, I found that I could make everything I wanted to eat at home and it would taste better (though it would not necessarily be less expensive than a meal out). Since we arrived on Thursday, we've eaten out every single day. And mealtime has become very, very quiet. We're all eating with our eyes closed, savoring the explosion of flavours, stuffing ourselves until we almost have to unbutton our pants just to make it home. A foodie friend of mine from Macau (by way of Mexico) recommended a Mexican restaurant here, Cantina Agave. Friends, if Heidi recommends a place, take it as the gift it is because oh my goodness, the food was so good we've already been there twice, in less than a week. The staff remembered us and our drink order and brought it right out as we sat down. Which is something else I've missed in Macau... excellent service! It will be easier/harder than expected to live here. Easier, because the grocery stores stock everything you've ever purchased in the United States. We will lack for nothing. Harder, because the price of said goods are 5 to 10 times more expensive than what you'd pay in the U.S., or even Macau (if you can find the products to begin with). Easier, because every restaurant chain and type of cuisine that we have missed while living in Macau is here, just waiting for our order. Harder, because the wait staff at the restaurants do not speak English, or have English menus. We ordered water at a pizza joint and got a hot, lemonade-type beverage (Which prompted our first words learned in Mandarin beyond hello and thank you: Cold water!). Reese's Peanut Butter Cups... not available in Macau. 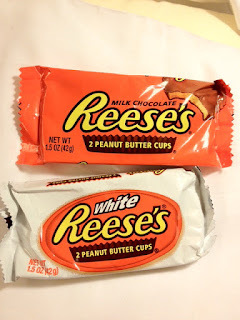 Reese's White Peanut Butter Cups? Heaven to this girl who cannot consume chocolate! And fully available in Shanghai! If you don't mind paying $2.75 USD. Hong Kong and Macau are NOT China. As "western" as Shanghai appears to be on the surface, it is very much a foreign country. Initial impressions made me compare it more to areas in the United States than with the Special Administrative Regions to the south. Hong Kong was a British colony, and Macau a Portuguese colony until they were recently handed back over to Chinese rule. But they still have almost every freedom you would find in the rest of the western world. This is not the case here across the border. The first major difference was the physical exam we had to undergo to get entry visas which will then allow us to gain residency (do not fear, this is not necessary if you're just coming for a visit!). The "simple" test was alarming to me. We were tested for colorblindness, eye health, and vision, given an EKG, weighed and measured, had our chests X-rayed, and gave up a few vials of blood which was tested for HIV, sexually transmitted diseases, cholesterol, liver function, Hepatitis, and blood type (I'm an overachieving A+, Michael gets an A-), and then given a thorough physical exam, all at the government hospital in Macau. Now that we are here in China, we'll go through the same tests again on Wednesday at another facility to move forward with residency permits. A second major difference from Hong Kong and Macau? As soon as I popped my Macau SIM card out of my iPhone and popped in the brand new China SIM card, access to the world of Facebook and Twitter closed down (along with any apps which use those sites for access). My sons had a few dozen questions about why the government would block social media. I'm not sure they were satisfied with the answers. But I was quite satisfied with their very intelligent observations and questions. At least they're becoming aware that different places in this world do things differently. I am way harsher with myself than I need to be. We've only been in Shanghai four days. Four 24-hour periods. And my level of frustration at not having things figured out already is pretty high. I'm normally the queen of research with insatiable curiosity. I want to know everything about everything, and it's frustrating when presented with so much that I don't know, particularly when I don't even know how to find the answers. Vacationing in Thailand or the Philippines was a completely different mindset. We were exploring for the joy of the adventure and thrill of discovery, and we knew it was just a week, tops. Here in Shanghai, it's less about joy and thrill and more about finding the things we'll need to survive for many years: how to work the washing/drying machine, where to find affordable groceries because we can't eat out forever, how to communicate with farsighted taxi drivers who don't speak English and can't read the writing on the map you're trying to show them, and how to quickly make friends in a very established expat community which is more stable/less transitional than the one we just left, and therefore a bit more set in their ways, less friendly to newcomers. And still manage to be a great wife and mother, making this transition manageable for my family. Because we moved here directly from another foreign country and not from our "home" country, my confidence was pretty high. After all, I was an expert in getting around by foot or public transportation not just in Macau, but also in Hong Kong which we visited at least once a month. Having a bad day? Nothing boosts your mood or confidence like successfully getting from one end of a country to another using public transit with nary a glance at a map or guide. Not having a car of my own never stopped me from exploring far and wide! And now suddenly going from one foreign place to another, which looks similar (Chinese writing, taxis, buses, trains) but isn't, has completely destroyed my confidence. What I do know is that it was easy to navigate Japan, Hong Kong, and Macau as soon as I found the key. In Japan, it was learning to read and speak the language. In Hong Kong it was just figuring out the MTR maps and how to board the Star Ferry and Trams with a stroller. In Macau, it was randomly getting on buses and riding them around until I was fully oriented with the place (and knowing it was small enough that I could never be truly lost). I don't yet know what the key to Shanghai is. And I don't know why I think I should have it figured out in only four days. I put too much pressure on myself. But it is my job, my role in my marriage, our family, to pave the way for us to make a new place a home. I take it pretty seriously because I know what it takes to make an international relocation successful for our family. I guess I can just say my anxiety to have it all figured out immediately is in my A+ blood. I need to remember the lessons in patience I received in Macau and apply it to Shanghai, being patient with myself first and foremost! Right now I'm quite impatiently waiting for our puppy to arrive! Heather, you are an amazing woman! I don't know if I could ever confidently learn how to navigate through a foreign country. And yet you have done it time and time again. I remember how impressed I was when I came to visit you in Japan. You had only been there a few short months and yet you showed me around the area as if you had lived there for years! Be patient with yourself and you will get it down. I just remember how frustrated the contestants on the Amazing Race are every time they go to China. Same thing. No one speaks English, taxi drivers don't read what's on the clues in Chinese. I can remember those episodes and feel your pain. But what an adventure!! Hang in there Heather! I know you will get the hang of it, and much sooner than most people! So when do the Mandarin lessons start?! You are a trooper! I'll keep praying! I am so glad you guys enjoyed Cantina Agave. I hope you try the rest of the restaurants I mentioned. 2. City Shops (several in town) are supermarkets with mostly foreigner items. Good but more expensive than Carrefour. My favorite is METRO (near Carrefour Pudong, a sort of Sams Club!). 3. Search on google for the Professional Ladies Club (or something like that) is a very nice group of working ladies, they organize very interesting activities. There is also an Expat Community Club. Ask in your Consulate. 4. Smartshanghai.com has a very handy and easy to understand map of the city with metro lines, buses, museums and restaurants.